The Public Brewery in Croydon is one I only learnt of relatively recently. I actually found out about it through a Scottish beer reviewer, who does his stuff on Youtube, who was staying at a friend's house in Croydon. In any case we thought that we'd pop in on the way back from Yarra Glen. The brewery is housed in an old brick warehouse in the back streets of Croydon. It's surrounded by veggie gardens out the front and the whole area has a really cool vibe. 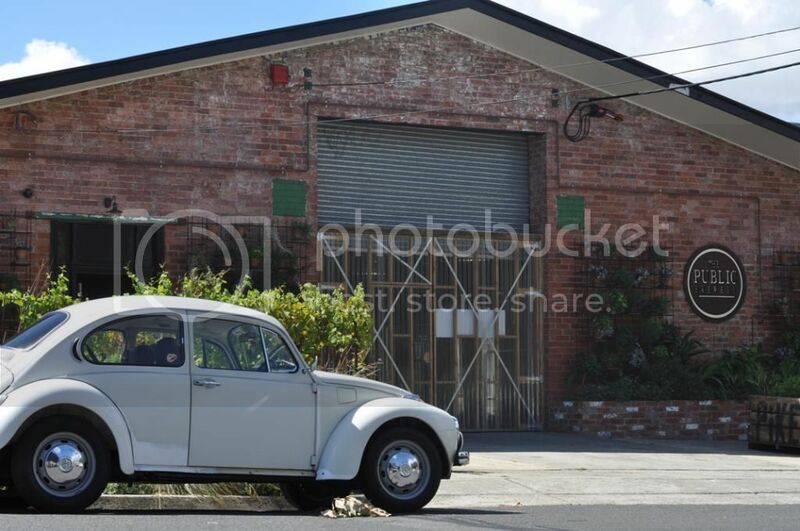 The old VW Bettle out the front really added to it in my opinion. 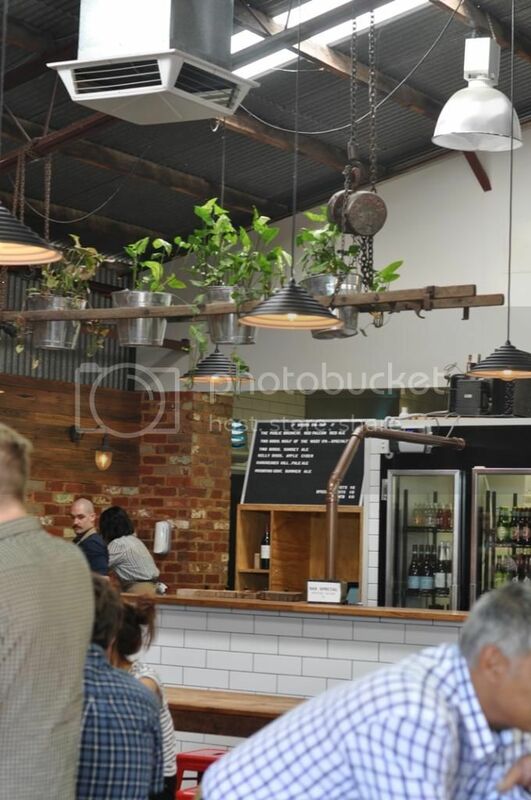 The garden vibe continues inside with a vine handing above the bar, see below right. The sight of plenty of stainless steel inside the brewery as you walk in is a pleasant sight after the distinct lack at Hargreaves Hill. To get to the bar and main seating area you have to walk past the whole brewing deck with light streaming in and catching it. All that stainless steel leads me to one of my favourite things about The Public Brewery is that they let people brew on small systems at their brewery and provide brewing staff to help, for a fee naturally! It's a really good way to spread the craft beer bug, especially in an area of Melbourne not as well known for it's love of craft beer. My first gripe with The Public Brewery was that they only had one, yes ONE (1)!, of their own beers on tap. The 6 taps were at least filled with Victorian craft beer and cider, with one from Hargreaves Hill (where we'd been earlier in the day), two from Two Birds, the always excellent Mountain Goat Summer Ale and the Kelly's Apple Cider, which often gets rave reviews from the cider drinkers I know. Naturally, the first beer I settled on was the only offering from The Public Brewery on tap; the Red Falcon. The beer was brand new, less than a week old, and was a tasty American Amber/Red Ale. It had good hop bitterness to go with the maltiness you'd expect from the style. At 5% ABV it was very drinkable! As time was a bit short before we had to be elsewhere, I only had one more beer. That beer was Two Bird's Wolf of the West IPA. It's a beer I'd been looking out for for a while, but seemed to keep missing. It didn't quite live up to the hype though, with a lack of bitterness letting down the lovely dry citrus flavour and texture. It did however go down very nicely in the sun! 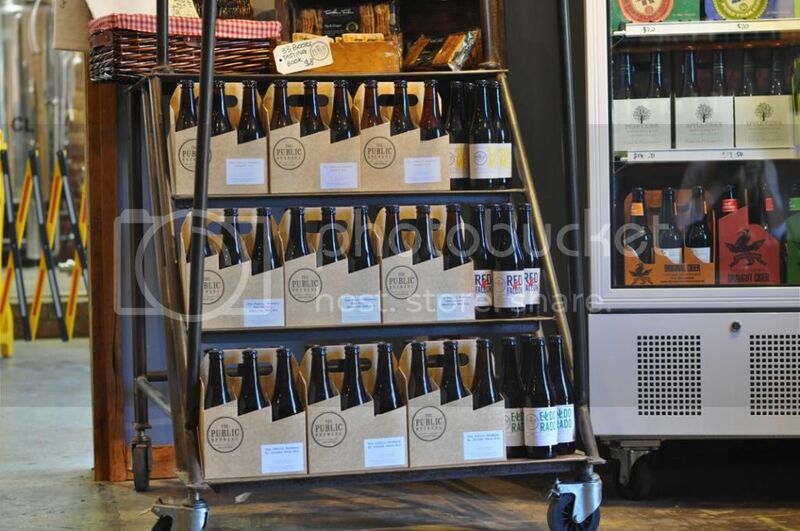 The onsite bottle shop is a nice touch as well and is well set up right as you walk into, and subsequently out, of the brewery. Naturally we stopped in on the way out and picked up quite a few Victorian craft offerings as well as 2 further beers from The Public Brewery, which I will endeavour to consume and review in the not too distant future. I was incredibly impressed with atmosphere at The Public Brewery! It really felt like a craft brewery! You could hear the buzz of chatter from outside in the lovely sun splashed beer garden where we ended up finding a table. For a relatively cool day, 22 or 23 degrees, it was hot in the sun and I actually felt myself burning a little. This was a much better brewery experience. The fit out is superb and really suits the warehouse vibe of the venue. I'm looking forward to sampling a couple of the other beers that I have. I'll also be making sure I make a longer visit to The Public Brewery, it was a great venue that I would love to spend more time at - hopefully next time they have more of their own beers on tap! If you're looking for a brewery out near Croydon, I'd highly recommend you vist The Public Brewery!